It’s the Avenue of Aspiration. Along Lemmon Avenue between the Tollway and Northwest Highway, there are nearly a dozen high-priced car dealerships: Porsche, Cadillac, Lexus, Mercedes, Bentley, Maserati, Hummer. Of course, many American cities have showrooms like these — there’s a Ferrari dealership in Plano, Arlington has a BMW showroom. And ever since the ’50s, car lots have tended to cluster like this along a particular avenue in a town — a vehicular nirvana — the better to attract customers. You want a certain kind of car, you come here. But nearly all of Lemmon Avenue’s luxury car lots were significantly upgraded or built entirely from scratch in the past several years (they’re still going up: a new BMW lot is underway near Mockingbird). 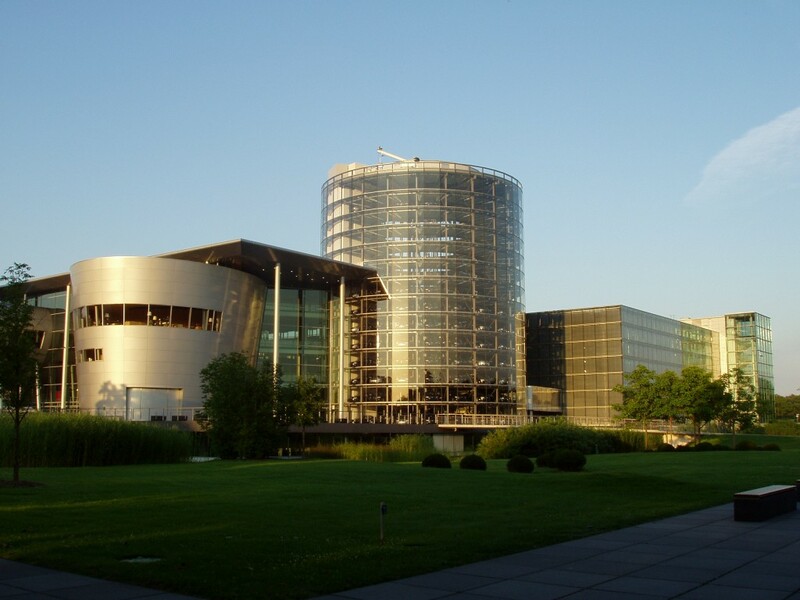 So the collective visual impact of their architecture has been much greater than a single re-do: It’s clear these are not your father’s Oldsmobiles. The designs and functions of dealerships have changed. The new buildings are sleeker than more conventional car lots. 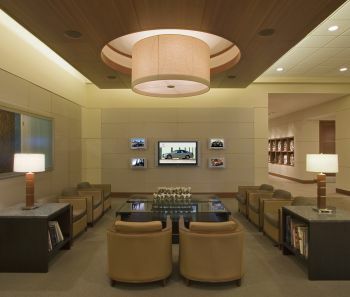 Their exteriors often recall streamlined airport terminals; their interiors are appointed like resort hotels. They have lounges and coffeeshops, reception areas and Wi-Fi. They have abstract prints on the walls. Yes, fuel prices have rocketed through the roof this year — although you might not know it from inside several of these dealerships. And car sales have been seriously hurting, particularly those of SUVs. Even the number of dealerships themselves have been in decline across the country for several years (which makes the growth along Lemmon a revealing statement about Dallas and luxury cars). But the changes to the auto showroom have been going on for several years already, changes in response to increased competition, changes to the showroom’s looks and the different ways it gets used. 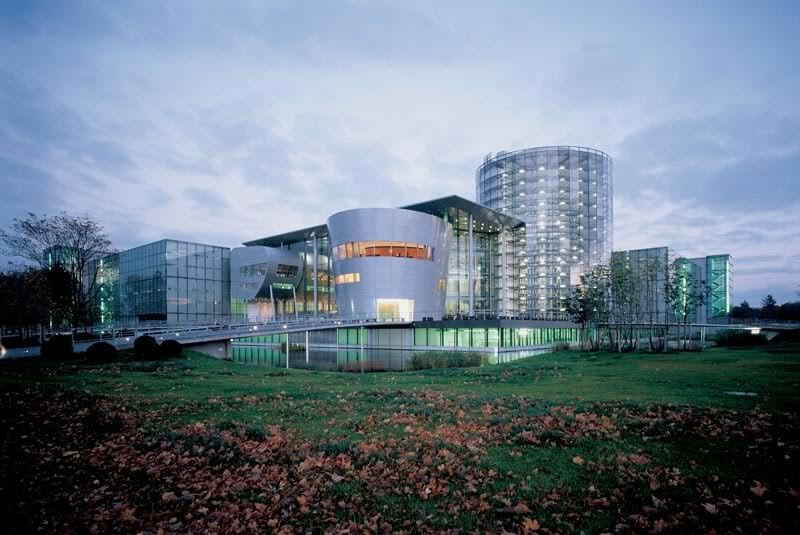 What has happened, says Dan Neil, the Pulitzer Prize-winning car critic of the Los Angeles Times, is that auto manufacturers and dealers have recognized “the psychic and emotional content of architecture.” The new buildings are designed to embody the appeal, “the message” of the cars inside. This is relatively new for the car industry, says Dennis Doordan, chairman of Notre Dame’s art and design program. For many years, car companies used industrial designers — not professional architects — for their dealerships. Despite the flashy neon, they were mostly functional buildings: showroom, sales office, mechanic’s shop and what amounted to a parking lot full of cars out front. When you had only Detroit’s Big Three to choose from for a ride, says Neil, the retail environment had a carnival atmosphere with strings of flapping pennants and “No Money Down!” painted in big letters on the windows. Many dealers still have all of that, of course, plus a big, blue, inflated gorilla on the roof. But nowadays, with a dozen different car lines vying for the same market niches — the high-performance sedan or the crossover sport utility — the competition has been making companies push for distinguishing features, push for a consistent, highly refined public image enshrined in its buildings. They want to make the dealerships more clearly marked for visitors (where’s the parts department? ), not so aggressive, not so overwhelming. Manufacturers have developed design programs, a set of requirements aimed at maintaining the corporate brand. These guidelines are “not a cookie cutter design,” explains Kurt Fegraeus, general manager of Aston Martin of Dallas. 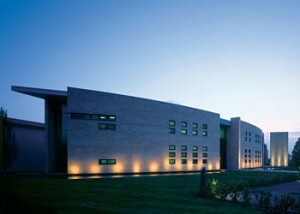 “It’s more an overall philosophy of design.” With Aston Martin, the aesthetic “is very modern-looking, very museum-quality.” For his dealership, that includes using square-meter slabs of travertine marble on the floor and exterior wall — tiles dug from the same quarry in Europe that supplied the striking company headquarters in Gaydon, England (above). There’s even a “little mountain” in front of the dealership. New owners can test-drive their Land Rovers, clambering over the rocks. Odds are, they may never actually go “off-roading” again. The newer car-lot layouts mark a changed relationship, notes Charissa Terranova, a professor of aesthetic studies at the University of Texas at Dallas — a changed relationship between the dealership and the street, the dealership and the customer. Older car lots, she says, tend to be “outdoor” environments: The showroom/service center is often at the far end of a field of cars, and the buyer may spend hours outside, kicking the tires. The newer showrooms, on the other hand, are closer to the street, more welcoming to the customer, bringing him inside. They’re more of a controlled, “interior” encounter, she says, more like a boutique or a home furnishings store with a very particular “shopping experience” in mind. In fact, at Park Place Motors, the new Mercedes, Porsches and Smart cars for sale are actually kept out back, in an extensive covered garage with its own mini showrooms. This means the potential buyer enters from the street and tours the entire building before he gets to the model he wants to purchase. The tour is deliberate, says Neil Grossman, president of Park Place. Park Place customers are not buying just a car, he says. They’re investing in service and everything that it entails: a dealership with a lounge, a cafe, DVD players, a playroom for children, a trained staff and a repair shop with 200 service bays. In effect, such dealerships welcome a buyer to an exclusive lifestyle — they’re “aspirational,” says Dr. Doordan of Notre Dame. Becoming a “member,” he notes, means that the car buyer has a different relationship with the car company. Supposedly, the relationship is no longer simply financial. The car buyer isn’t just another consumer with a complaint. As a “member,” he seems to have a say in the way things are done, he has access, his needs are being served. Even the websites for these dealers reflect this new emphasis. They tout their facilities as much as they do the vehicles. 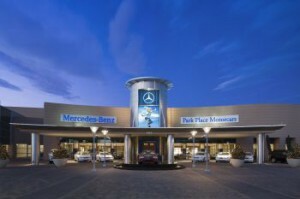 Park Place Motors’ interactive site functions like a computer game such as Myst with different virtual rooms to explore and an onscreen receptionist to help the visitor with information. 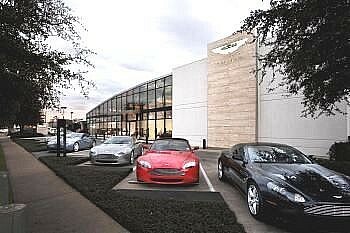 The Aston Martin of Dallas site has a photo gallery extolling its owners’ lounge, meeting room and stylish exterior. 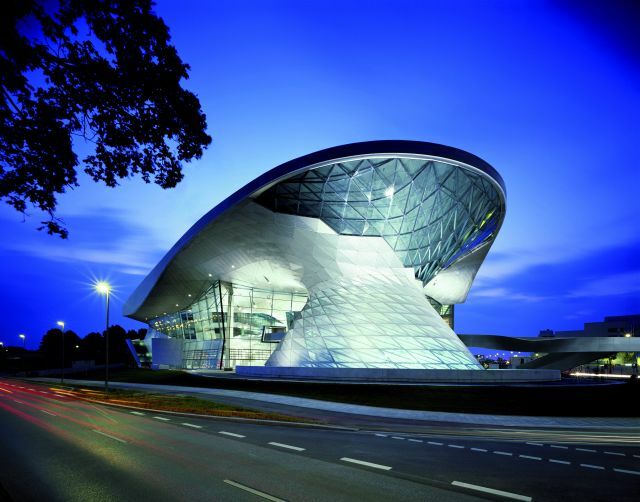 But all of this is hardly a surprise: Expensive, elaborate cars are getting expensive, elaborate buildings. True, the idea was relatively late in taking hold in the auto industry. (Or perhaps in coming back to it. In addition to the landmark Lingotto Factory fom 1923, there’s Eero Saarinen’s famous, 1956 GM Technical Center, an icon of minimalist, modernist architecture). What is new are the expanding roles that showrooms are taking on: hotel ballroom, meeting room, private club. The dealerships are trying to serve more public, social needs, insinuating themselves into people’s lives, associating their brand — with youth, with high-end aspirations, with athletic recreations, with family life. It’s the car lot as community center. Park Place Motors, for example (above), regularly holds charity fundraisers, casino nights, dinners, fashion shows — “no less than 50 events a year here,” says Grossman, the president. A favorite site for such affairs is the company’s vast service center. Some cars will remain elevated on the pneumatic lifts, displayed like sculptures among the tools. The other lifts are for eating dinner. Aston Martin of Dallas, meanwhile, has gone the route of the “private club” (left). Each car buyer is given his own key card. Swipe it through the electronic reader on the wall of the showroom, a frosted glass door slides away — very James Bond, Mr. Fegraeus says dryly — and the buyer enters the “owner’s lounge.” It’s a modern, two-level apartment, complete with large-screen TV, Le Corbusier-style seating, a separate conference room and a stocked bar with a wine fridge. In fact, some dealerships have opened satellite showrooms in shopping malls, while others are so big, with so many franchises and eateries under one roof, they are anchoring malls themselves. Ah no, says Mr. Fegraeus. No sweet sixteen parties. Wouldn’t be appropriate. And yes, people have asked. 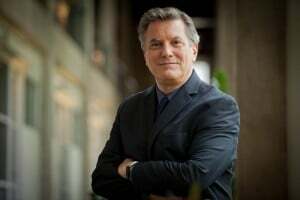 It is typical and sad that the local press, including KERA, seeks the unengaged academic community to find commentary on a national trend started in Dallas’ commercial market. The sad part is the effete attitude that gives no credit to the designers in Dallas who are leading the national trend. Score one for the dimmly lit local press. ps. You are also violating our photographers rights by publishing the images of PPM Lemmon Facility without his credits. Architect and Designer of: Aston Martin, PPM Mercedes, PPM Porsche, PPM Smart Car, PPM ROLLS, Bentley, Masarati, PPM Volvo. Thanks for your comment. One of the things about journalism: We make our mistakes in public. So we correct them. I apologize for running the photos without due credit; that has been changed. But I was given the images by both dealerships – with no credit mentioned in either case, on a CD or via several e-mails back and forth. As for the idea that area media would deliberately ignore a local connection, if you think about it, it’s a little farfetched. Had I found a local source for the designs of these dealerships, for obvious reasons, I would have jumped on it. In fact, I did track down a Dallas-area dealership architect, but inquiries with that firm didn’t lead to a source that would have proved helpful. So I dropped it. In the event, I asked about designers at the showrooms – and got responses about corporate dictates, individual dealership input or renovation incentive programs. That’s why my story indicates that a number of these changes have been in the works for years. At the same time, as Mr. Farrell knows, some of these new changes, notably the dealers’ expansion into civic functions, go beyond the latest corporate update or model re-tooling. UPDATE: Mr. Farrell and I had a cordial phone conversation (it helps when you have a common enemy — in this case, a balky server that inexplicably kept kicking back all of my e-mails to him). We agreed that he would not loudly denounce me to all and sundry, I would press for the names of local architectural firms in relevant stories and in the immediate future, we would communicate by cleft stick.